Oneiromania, the third EP from Psychonautilus within a month, concludes this trilogy on GiveUsYourGOLD by this sonic research vessel captained by Thomas Tichai, who is also one half of both the creative duo behind GiveUsYourGOLD and label staple Psycho & Plastic. 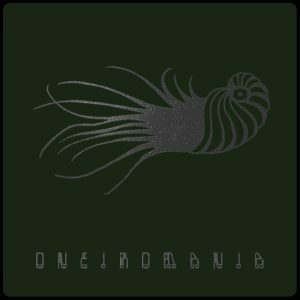 Oneiromania’s three instrumental tracks steer us into lighter territory and calmer waters after the dark turmoil of Metastability and pure angst of Notopia, while clocking in at a slightly longer total playing time of just under 20 minutes. Right from the get go, “Perceptronium” embraces us with solemn guitar and soft crackles before slowly unfolding as an angular kraut-funkster complemented by retro futuristic synthesizer textures. This is a the musical depiction of a past that never was, ever so slightly out of focus. “Mnemonicon” treads further on the theme of memory, or the unreliable wishful thinking often confused with it. This short track takes the light funkiness of “Perceptronium” even further, but retains a distant melancholia throughout with its mellow guitar lines and interwoven noise. We’re entering full on ambient territories, or dream land, with the closing “Oneiromania”. Beatless, but composed from similar found sounds, noise excursions, electric guitars and analogue synthesizer tones as the whole trilogy of EPs, Psychonautilus gently concludes this haunting dive through dense sonic worlds and the backwaters of the mind. We disembark on a last wash of white noise and droning bass and are back on land.